A third-generation study of toxic pollution in Puget Sound claims to be the best estimate so far of total amounts of toxics entering Puget Sound each year. 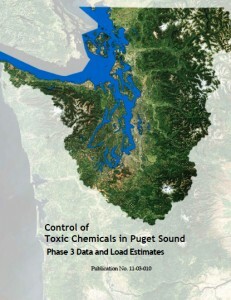 New report on toxics in Puget Sound (PDF 7.3 mb). Click to download. As Craig Welch of the Seattle Times points out in a story today, it’s a big exaggeration to think that Puget Sound is suffering through enough drips and drabs of oil — largely from vehicles — to equal an Exxon Valdez spill every two years. Craig is right to point out how previous studies overestimated the amount of several toxics. After all, politicians having been tossing around the dramatic Exxon Valdez analogy when it serves their purposes. Still, the total amount of oil or any other pollutant in Puget Sound is not really a good measure of the problems we face. If you want to understand pollution in a waterway, it’s better to measure the concentration of the pollutant, see where that level falls on a toxicity scale, then consider how fish and other organisms are exposed to the pollution. The new study for the Department of Ecology, titled “Toxics in Surface Runoff to Puget Sound,” analyzed 21 chemicals or groups of chemicals in 16 streams in the Puyallup and Snohomish river watersheds. The watersheds contain all different land types — commercial-industrial, residential, agricultural, forest, fields and other undeveloped lands. The idea is that researchers could extrapolate from these land types to represent all of Puget Sound. But such an extrapolation still requires a number of assumptions, which can throw off the estimates by wide margins. At least we can say the latest study involved actual water-quality sampling. Previous estimates — including those that produced the Exxon Valdez analogy — were based on measurements of stormwater in other parts of the country.